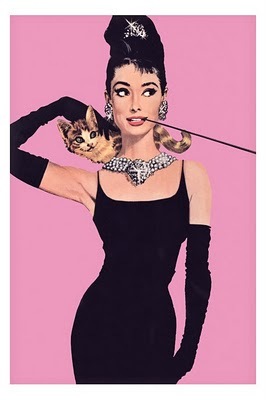 I was torn between highlighting two of my favorite Audrey Hepburn/Breakfast at Tiffany’s* shiny objects. 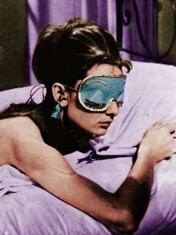 But since I no longer regularly use a long, slim, elegant cigarette holder (and no longer smoke cigarettes, for that matter), I decided to go with that symbol of late-sleeping decadence, the sleep mask. Here’s Audrey/Holly in hers–So adorable! I didn’t own a sleep mask until about three years ago when my sweet darling tucked a blue velvet one into my Christmas stocking. Sleep and I have a tortured relationship: I hate to do it until I’m doing it. Then I don’t want to stop. And sleep accessories? Never had them beyond a nightie and a pillow. Accessories just seemed too fussy. Now I can’t imagine trying to sleep past six a.m. without my trusty, soft sleep mask (or “eye muffins”as I generally refer to it). This Christmas I received a foamy Bucky sleep mask in my stocking. It’s the blue/flower/butterfly mask–second from the bottom. Highly recommended for sleeping in until eight or even (gasp!) nine o’clock! I ran across this grisly pelt as I was looking for sleep mask pics. It’s rabbit fur. Just think of it as The Anti-Shiny. Ew. *Have you read the excellent Truman Capote book on which the film was based? Brilliant, much edgier than the film. P.S. Totally ooked-out by the rabbit fur version, if only for how it might SMELL! Eww. I have one from a stay at a nice hotel on the beach a few weeks ago. Haven’t tried it yet–now I will! Don’t hate me, but those masks look like eye bras. but cute eye bras! 😉 I used to have blackout curtains in my room, making it quite pleasant to sleep in! I tried a sleep mask once when I was travelling and it annoyed me. I’m a light sleeper and a restless sleeper so somehow every time I moved, I nudged it and ending up waking up. Poor you, Kim. 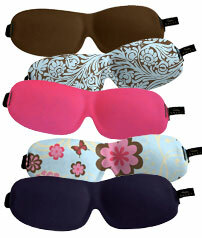 I’m glad you have some fun sleep masks to make your migraines look good–because I know they sure can’t feel good. Sending hugs! btw-I think I saw mine on your page long before my fam gave it to me. Hi, Tia. Let me know how it sleeps! Carrie–You’re too funny. I thought exactly the same thing. Danielle–I often wake up with it wrapped around my ear or under my pillow. It’s no fun groping around for it in the dark at 3 a.m.
hay laura, happy b’day… whenever it is! I hear Elvis had a crew to cover his hotel windows with aluminum foil – no eye bras for him! Seriously though, I’m very happy you choose to sleep with mask instead of a cigarette holder.